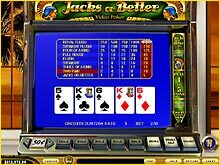 Jacks or Better is one of the most popular Video Poker Games. The name "Jacks or Better" refers to the fact that the lowest (or least valuable) standard poker hand that will payout in this game is a hand containing at least a pair of Jacks or more valuable cards. The game uses a standard 52 card deck. There are no Jokers or wild cards in Jacks or Better.